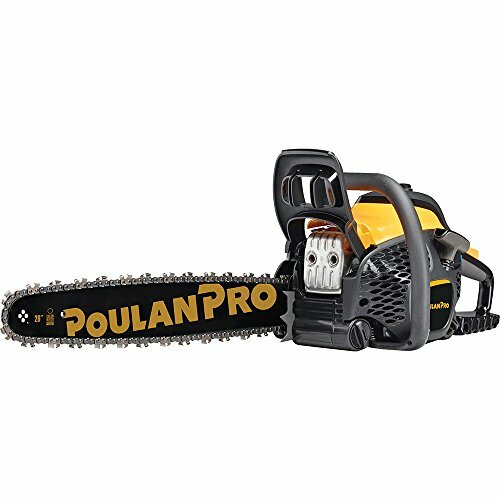 There are three types of chainsaws that you can buy: gasoline-powered, cordless-electric and corded-electric varieties. Gasoline chainsaws are the most powerful models available and are well-suited to the largest of tasks. However, they are also the models that require the most maintenance, as well as needing to be regularly refueled. Still, for those undertaking tasks such as cutting through large logs or trees on a regular basis, they are the best tool for the job. Below, we will look at 5 of the best gas chainsaws that you can buy in 2018, including the best budget model and our own pick of the bunch. What Makes A Good Gas Chainsaw? Our pick of the best gas chainsaws available is the Husqvarna 240. Overall, this is the best chainsaw we've ever reviewed. It has enough power for most situations, makes a clean cut, and the 16" bar should be suitable anything but the biggest of jobs. The comfortable-to-use ergonomic design is the icing on the cake. Our runner-up is the Husqvarna 455 Rancher, which has a larger 20" bar, and a more powerful engine. If you're looking for ultimate performance, this may be the saw for you, however the extra size & power comes with both a higher weight, and a higher price. Our favorite budget option is the Remington 4214 Rebel. Though it only has a 14" bar, it's more than capable of tackling most light-to-medium duty tasks. The light weight and low cost are attractive features. If you don't need the power & don't want the extra expense of a gas chainsaw, have a look at our reviews of cordless chainsaws here, and corded electric chainsaws here. 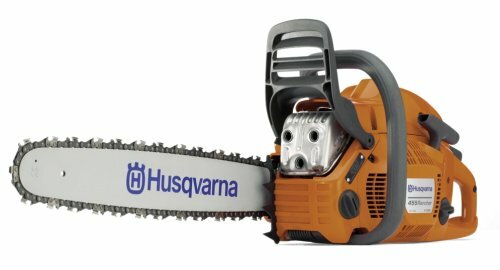 The Husqvarna 240 is, overall, the best gas chainsaw we have seen on the market. We believe it has everything most people will ever need in a chainsaw, at a reasonable price. 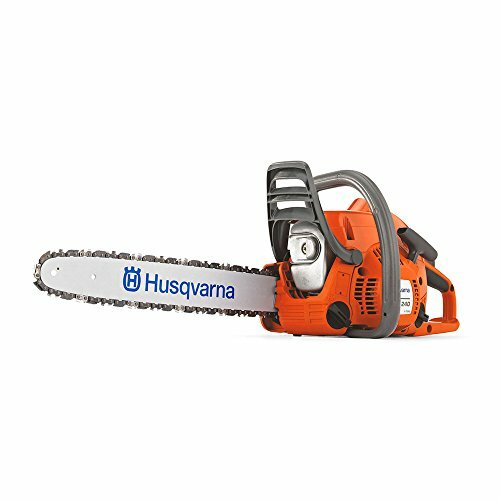 The Husqvarna 240 2HP gasoline chainsaw has a generous 16-inch blade bar, which extends enough reach to complete larger tasks with relative ease. It features a tension adjustment knob for when you need to rapidly adjust tension on the go, in the middle of a task, which helps to avoid potential injuries and achieve a cleaner cut. Out of the box, this product comes with chain oil included, as well as a blade cover and chain. The chainsaw also has a number of built-in safety functions, which is a godsend for anyone worried about the risks posed by gasoline saws. Kickback resistance will help to protect you against injuries, and vibration reduction aids in a more comfortable cutting session, while preserving the machine's lifespan over time. Though you might not immediately think about comfort when considering a chainsaw purchase, this saw is designed specifically with ergonomics at the forefront of considerations. A double-grip handle features specific contours designed to sit snug against the body, while the materials are comfortable over prolonged periods of use. There aren't many lot of negative points to raise with this gasoline saw. Aside from being pricey, it can often have difficulty getting started, especially in colder climes, but that’s a common issue for gasoline chainsaws and one you might just have to accept. Otherwise, it can sometimes be temperamental when tasked with cutting thicker wood; it’s best suited for pruning or cutting through branches and small logs, as opposed to trees. 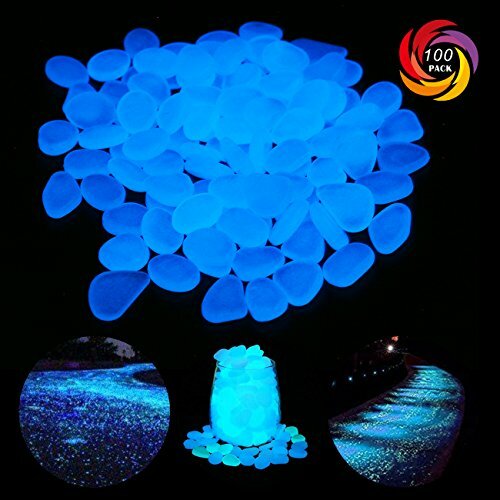 The product is guaranteed to be free from manufacturing defects for up to 1 year from the point of purchase. In terms of industry standards, this is a shorter term than you’ll see with some other models. The ​Husqvarna 455 Rancher features a large 20-inch bar and chain which is well-suited to tackling some of the largest tasks that you can throw at it. The 55.5cc X-Torq engine is designed in such a way that it reduces the typical emissions produced by a gasoline-powered chainsaw, while also reducing the fuel consumption of the saw. Despite its size, some well thought-out choices have gone into the design to keep things comfortable. An ergonomic front handle ensures a comfortable grip and less fatigue, while the air filter is on a quick-release mechanism for easy access when cleaning or replacement is required, and there are also safety features built in. If you're going to be regularly cutting through average-sized wood, such as preparing firewood or felling moderately-sized trees, then the 455 Rancher is an ideal chainsaw to choose, provided that you aren’t concerned about the reasonably high price tag. One of the main – if minor – issues posed by this saw is that it weighs in at 20lb; given that's about 5lb heavier than the lightest chainsaw on our list, it’s easy to imagine how much more quickly you can fatigue when wielding this model. That said, it’s to be expected from a chainsaw that features a 20" bar and is capable to felling larger trees, but it’s something to keep in mind if you’re not overly strong. A warranty is provided on the chainsaw by the manufacturer, though not all parts are covered and there are some caveats, so it’s worth looking more at the coverage. 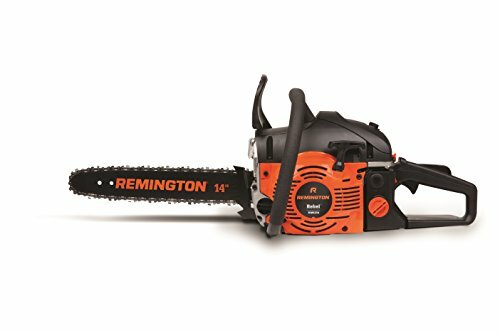 The RM4214 Rebel chainsaw is the most compact offering to come out of Remington's line of saws, weighing in at 15.7lb with a 14-inch bar and chain. That said, it does not lack any power despite its small size. The durable 42cc engine provides constant and reliable power, while the compact and ergonomically designed body makes maneuverability straightforward. A number of design considerations help to justify that the price isn't scaled down to match the size of the body. The saw features a QuickStart system to improve the success ratio of pull starts, while an anti-vibration system aids in prolonging both the lifespan of your machine, as well as the level of comfort experienced during use. In terms of other positive design choices, the air filter and spark plug are accessible without the need for tools, while a cushioned handle further improves the comfort of this saw in your hands. All of this is backed up by a 2-year warranty that guards against manufacturer defects. Bar oil is thrown in, too. The Poulan Pro 50cc gasoline chainsaw is powered by a 2-cycle engine that promises longer engine life thanks to 'Duralife', though your engine's lifespan can still largely depend on how well you look after your tool. The engine produces a great deal of power, though starting it up isn't always the most straightforward of challenges. One of the great points to highlight about the saw's engine is technology used to provide an effective air cleaning system; this system removed the majority of the debris that's accumulated within the air intake before it can hit your filter. The filter will require less frequent cleaning, as well as enjoying a longer overall lifespan. This saw is backed by a 2-year warranty. A product of Great Britain, the TIMBERPRO 62cc 20-inch gas-powered saw is built from durable materials, featuring a generously wide cutting radius and a powerful gasoline engine. It's small and lightweight, yet tough enough to make light work of branches and bigger logs, as well as most mid-size trees. The saw specification features ergonomically-designed handles that are comfortable over extended periods of use, although design-wise, the saw isn’t quite up to the same standard as some competitor models. However, the inclusion of a range of accessories is a real bonus to this package. An additional chain is included in with the chainsaw, as well as a tool kit and storage carry case. There's a lot of power considering the budget, and it's not especially heavy either. However (perhaps owing to it's origins in the UK), there are question marks over it's warm weather performance - some users have reported the engine stopping once it had warmed up. If you’ve settled on a gas chainsaw, as opposed to a corded or cordless-electric model, then you’re already halfway there. That said, there are some other considerations to make before you decide on a final model to purchase. When we talk about the size of the cutting bar, it is represented in inches. A chainsaw bar ranging from around 14 to 16-inches is suited to smaller, more lightweight tasks. Conversely, a bar in the range of 18 to 20-inches is more suited to large cutting tasks. In general, bar can range from around 8-inches to 42-inches, so you should gauge the size against the task you need the saw to perform. Larger engines give you more cutting power, but also use more fuel and weigh more. Generally more compact saws in the 14"-16" range have engines in the 2hp range (around 40cc), whereas you'll need over 3hp (about 60cc) to cut through larger trees & branches with a 20" or longer bar. Gasoline chainsaws are notorious for having a higher level of vibration than their electric counterparts. Though it might not seem like a huge issue, over time it can lead to degradation of the machine’s components, as well as tiring you out more quickly when holding onto the saw. Look for anti-vibration features built into the saw to help avoid these problems. Some chainsaws feature no automatic lubrication, rather having a button that you must continually depress to keep the chain oiled. An automatic oiling or lubricating feature can prevent the need to do this manually, ensuring that the chain remains oiled and not susceptible to wear. One of the main safety concerns surrounding gasoline-powered chainsaws is the risk of kickback. Whereas many electric saws will shut off when a handle is released, gasoline models will not. You should always maintain your PPE, as well as remaining behind the engine and not standing directly above the bar. Here are some other general things to be aware of. Make sure you read the instruction manual supplied with your chainsaw, and follow all the safety precautions advised by the manufacturer. Ensure that you drain the gasoline from your chainsaw prior to long-term storage. There were no recalls listed for any of the chainsaws mentioned here at the time of writing (early 2019). However, it's always a good idea to check the latest information at the Consumer Product Safety Commission website before buying any large, expensive or potentially dangerous product. Do you own any of the gas chainsaws mentioned here? Did you choose a different one? Let us know in the comments!